October is a great month to have that one final yard sale before we hunker down for the cold winter months. I know this first hand because I held a community yard sale last Saturday, and collectively each yard saler made over $250! Lots of folks were out looking for bargains, and the sellers were glad to ditch what they no longer wanted. The more time you have to plan the better, but here’s what you need to know. If you can start that early great. But more than likely you only have a few weeks to get ready. 1. Consolidate all your stuff: If you’re like me, you probably do this periodically all year. I have a special place in my basement that I put all my yard sale stuff. This way I know exactly where to find all the junk I want to sell come yard sale time. If something has more value, skip putting into the yard sale box, and instead look at selling it either consignment, craigslist.com or ebay.com. I did this with a hoard of clothes I had to sell. I put my most costly items into a bin for consignment and sold the rest at the yard sale. My yard sale clothes alone generated more than $160! 2. Pick a Date: Choose a date that works best for you and for the people you are trying to attract to your yard sale. 3. Decide how much space you’ll need: You want to keep in mind how much space you’ll need, and what set up you want so your stuff looks the most attractive. Make sure you have enough tables, racks, clothes hangers and the like to set up your space to maximize sales. 1. Get supplies together: You’ll need tape, scissors, markers, grocery bags for packing up purchases and newspaper to wrap any breakables. Now is when you want to get your tables and racks together. I also have brought with me hand sanitizer and masking tape for labeling. 2. Get the word out: Today you don’t need to advertise your yard sale in the paper if you don’t want to. The internet is loaded with yard sale Facebook groups were you can advertise your sale, or you can post it on craigslist.com too. 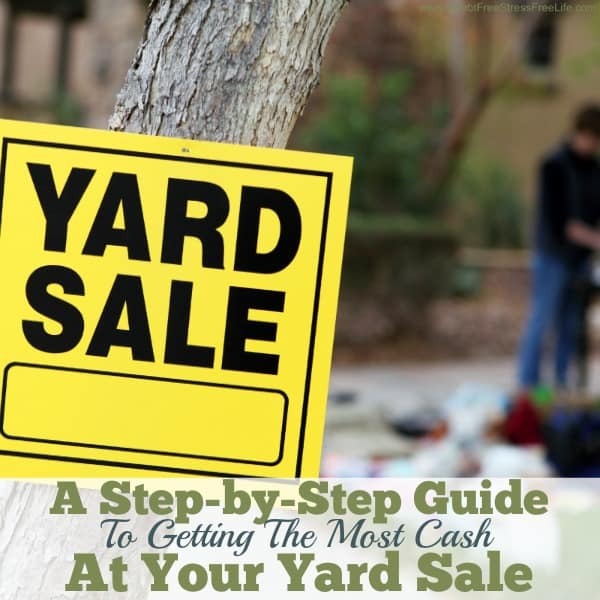 Other sites include yardsalesearch.com and garagesalefinder.com. Be sure to list a few hot items you have for sale to entice buyers to show up. Pictures are great too! 3. Post directions: Nothing beats and an old-fashioned poster with directions to get people to your door! 4. Get help: Yard sales are more fun when you have friends and family there to help out. 5. Label: People like to know what the price is without asking. Price your items competitively so they sell fast. Leave some room for negotiations if you can. If you price too high, most won’t even counter offer, they’ll just walk away. 1. Set Up: If you’re having a garage sale, you can start setting up space the day before. If not, and you’re having a yard sale, you’ll need to wait until the day of. Make sure things are clean and organized. Keep like items together and display items as attractively as possible. Put your best stuff out front for the passerby to see. 2. Clean up plan: You don’t want to have to lug things back home. Either find a local charity that you can drop off the remaining unsold items, or schedule a charity pickup. Another option you can try is to post an announcement inviting freecycle.org members to come down at the end of the yard sale to grab things for free. Post this announcement an hour before closing your doors. People will show up and take the stuff away for you! 1. If you tag something for $50, and someone offers you $20, take it if it’s at the end of the day. The goal is to get rid of your stuff! 2. Set up a dollar table or two for one table. 3. Have a freebie box and periodically replenish with items that are not selling. Yard sales are a great way to get rid of the junk you just don’t want anymore. Having a good strategy ensures you not only get rid of your stuff but make some money too.